How amazing is visual communication? Skype, Facetime, WhatsApp, Google Hangouts – these are all awesome until we are accidentally photo bombed by a half-naked little brother during an important sales call. Or, we create a perceptual problem defending our work-at-home hours to our boss while our husband loads the jet skis in the background. 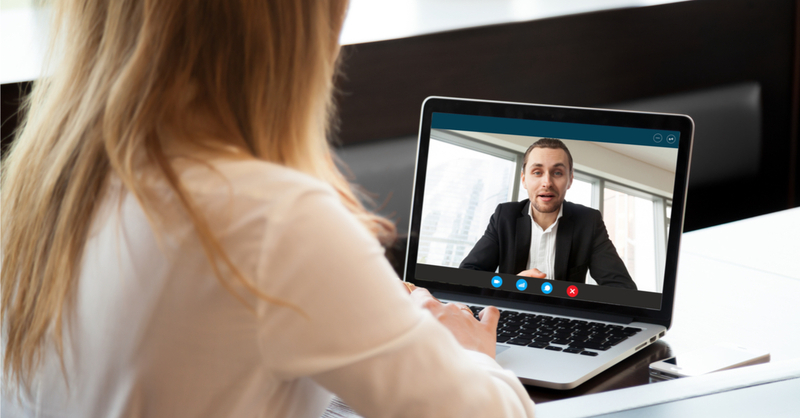 But take heart, needing a new job means you get to experience the latest trend in job interviewing – live or recorded video chat! More and more companies are using video for job interviews. This method of screening candidates saves time and travel costs for both parties, but there are pitfalls for the uninitiated. For example, Jerry* did his homework on the company, followed the video chat instructions, and instead of the one or two people he was expecting, there were eleven on the screen! This was intimidating enough, but as the questions began to fly, it quickly became apparent that the audio wasn’t working and the group could not hear his responses. They asked him to connect the audio via cell phone, and as he stood up to get his phone, he realized that he was only “dressed for success” from the waist up! Be yourself. Employers want to experience your screen presence, not a robotic avatar. Relax and let your personality and confidence shine. On that note, real robotic interviewers are a new screening trend for some companies, mostly via avatars. However, robots under development by a coalition between NEC, Kyoto, and La Trobe Universities, are able to interpret facial expressions that might indicate interests in certain areas. The robots can compare query responses with emotions and facial expressions to match with the optimal hiring criteria. So, do not be surprised if you see an R2-D2 – type personality coming soon in your next interview. Treat it as if you are C-3PO, but don’t be grumpy. Practice. Preparation is pivotal to success in an interview. To build confidence with this format, record some practice sessions with a friend. Select the appropriate outfit (bottoms, too! ), and remember that only your upper half shows, so facial expressions and personality should be front and center. As you practice, look at the camera, not sideways at the little screen in the corner. If you have a large screen, you can include your notes there so that you are not constantly looking down at a desk. Check your tech. If necessary, plan to change your device, appearance, backdrop, facial framing, distance to the camera, and technical settings such as lights, camera, sound quality, mic, and screen resolution. Sometimes there can be an audio delay, so be careful that you do not speak over your interviewer. If there is sound feedback, it is likely due to others on the line. If you can’t hear, politely suggest that others mute their lines, which should fix the problem. Don’t leave anything to chance; keep a phone handy in case the audio fails at either end. Nix the Noise. On a recent video call, participants were treated to the sound of a dog barking, terms of endearment between a husband and wife (awkward! ), and a babbling baby in the background. While you may not oversee the mute button, you are in charge of your video environment. Put Rover in the basement, turn off auxiliary phones and devices, and plan your interview for a time when your roommate is not coming home for hours. Back-up plan. Finally, don’t have a meltdown if a technical glitch causes an early end to the conversation. Problem-solving and adaptation are traits that employers look for, so don’t make too big of a deal of it. Begin the interview by asking for a contact and phone number in case there is a technical failure. Just be sure to have some pants on when you get up to grab your cell phone!